This page is dedicated to my father. I had wanted to visit the nature reserve with him when I next visited him in Escourt, KZN but he died before I could visit him again and take him there. 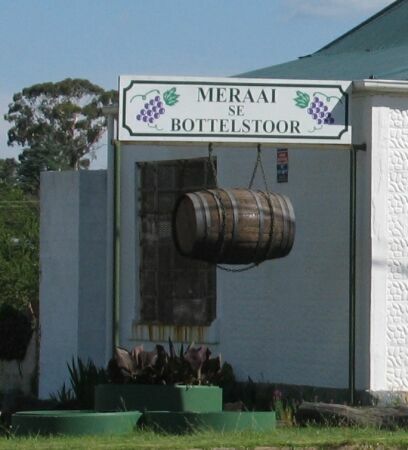 Memel is about 45 km northwest of Newcastle on the border between Gauteng and KZN. 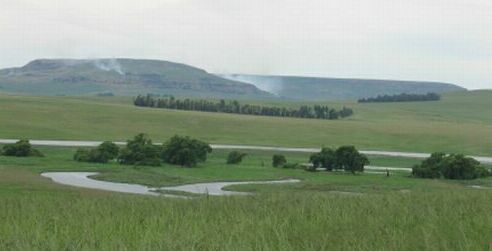 One of the main reasons that I wanted to visit the reserve and Memel for that matter was that there are a series of oxbow lakes in the area and the bird life was reported to be very good there. The following is a short description of my visit. 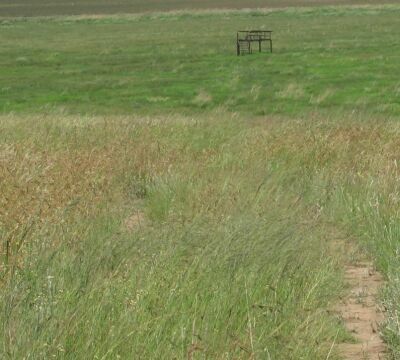 If you are thinking of going to the reserve, be warned: YOU NEED A 4X4!! Very simply put, oxbow lakes are formed by irregular erosion across a valley. Loops are formed in the river and, as it wears away the section between loops, these loops are cut off from the normal flow of the river. If you are interested there is a far better description of oxbow lakes here. There had been a huge deluge in the weeks prior to my visit and the oxbows were partially coverd by water, but the following two pictures should give you some idea of oxbow lakes and the beauty of the area. It really is a very beautiful place. BTW, that's smoke, not mist in the distance. 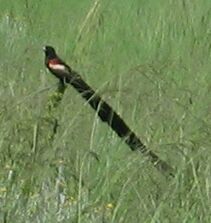 Aside from the one wildebees (gnu) that I saw in the very far distance, I saw only one other "wild" animal. 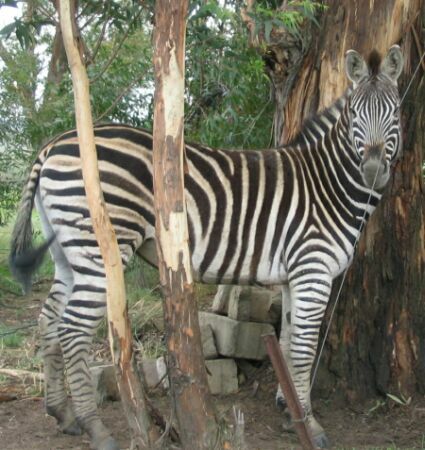 A zebra. It seemed to think it was a horse and was hanging out with a couple of saddle horses at one of the ranger stations. All over the place there are these warning signs; "Do not get out of your car. Dangerous animals." You must have seen the sort of sign I am referring to. Anyway, there is just one small problem; the gates are locked and you have got to get out of the car to unlock the gate and open it. 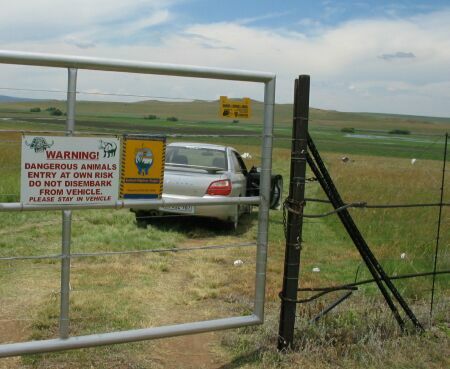 You then get back in the car, drive past the terrifying warnings, stop the car, get out and lock the gate. Ever mindfull of the electirical fence of course. If you are doff like me, you think that the electrical fence is switched on only during the hours of darkness. I suppose being a city boy, I assumed someone with larcenous intent would come and steal the hippos or something. And being a bit distracted, when exiting the one area I put my arm through the fence and lent it on the electrified wires to unlock the padlock on the outside of the gate. 10 000 volts at very little amperage, still makes you jump and gives you taut skin around the eyes, nose and mouth. It took ten minutes of serious thought to persuade myself to put my arm back through the fence again. 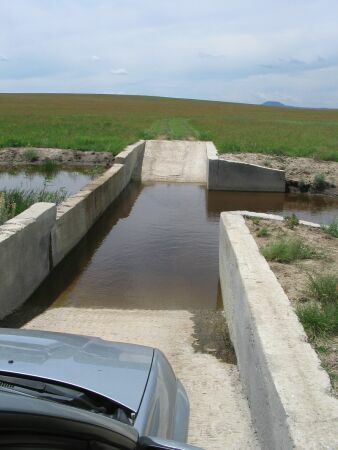 Another fun thing is crossing a river in the reserve. It was so different from ANYTHING I had ever seen that I stopped and got out to look at the arrangement. Well you would too. It looked more like at cattle dip than a crossing! The roads aren't really road, they are areas where the grass has been mown down to abou 15 cm. Signage is erratic and ambiguous. 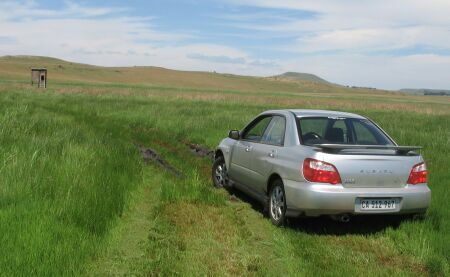 It was this very casual attitude to roads and to singage that nearly led to my downfall and the embarrasing necessity of calling for help to extricate a stuck Subaru. Fortuantely I had been 4X4-ing with the software support department with whom I work and I learnt one very good lesson. Go look and see what has happened. Decide on a plan of action. Look for flaws in the plan and then carry it out. I followed the road in the picture to get to the bird view platform in the same picture. Being cautious by nature I was driving slowly. Suddently the front wheels went down and startted spinning. I stopped and this is what I saw. The front wheels were heavily down in sticky, slippery, black mud. Forward was just sticky slippery mud, backward was hard ground. I got into the car, straightened the wheels, put the car into reverse, got the revs up to as high as possible amd popped the clutch. 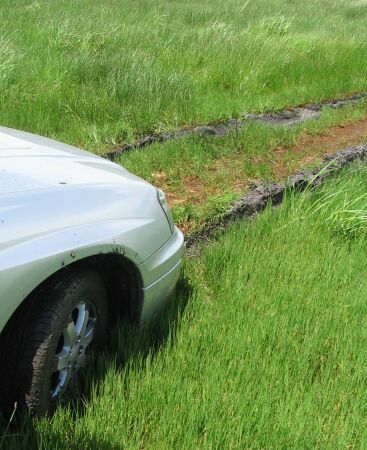 The Subaru erupted from the mud like rocket, screeched to a stop. I reathed a heavy sigh of relief. The birds were magnificent, but I was dissaded from getting any closer by my muddy experience. The only birds that got close enough to really photograph were the widow birds. 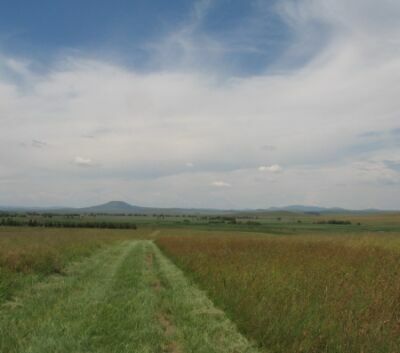 I left the reserve a and headed back to Memel after all that excitement. 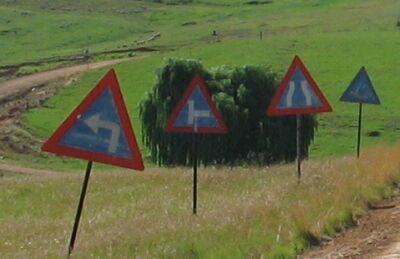 I must admit to being rather amused by this touch of Cape Town in the middle of Gauteng. 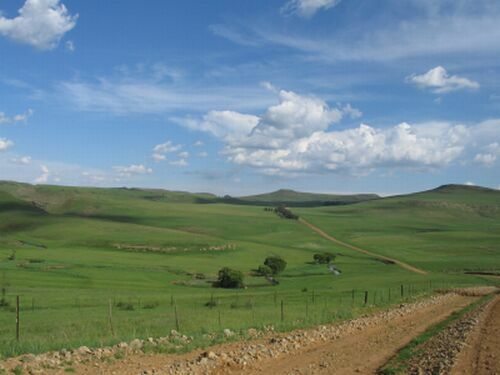 I never do anythig simply and headed back to Newcastle via a dirt road. I came across the intersection from hell on the road home. And this is what it looked like. Remember that the road is at about 20 degrees from the horizontal as well.